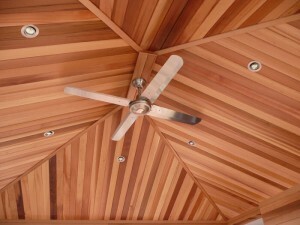 Western Red Cedar can add beauty and value to any home. Its visual appeal, natural durability, and resistance to insect and water damage make it an ideal choice for any exterior use. Western Red Cedar is available in a variety of patterns for use as exterior siding or accent walls. The options include Lap & Gap in 1×8 and 1×10, 1×6 V-Joint Center Match, and several beveled patterns that can be stained to any finish color or left to weather to a beautiful silver gray. The grades vary from a knotty, rough sawn, rustic look for more traditional applications, to smooth, clear, vertical grain A & Better which would dress up even the most modern of contemporary homes. Western Red Cedar decking, is available in either 5/4 X 6 or 2 X 6 dimensions. For 5/4 X 6, Eastside Lumber & Decking only stocks a “Good 2 Side” grade of decking. The difference between our stock and the typical 5/4 X 6 is easily apparent. There are no bark edges (wane) on it and it is darker in color because it comes from the coastal growth trees. Our 2 X 6 is all Coastal Architectural Knotty grade. Also cut from larger trees, it is a nice dark color which is indicative of the amount of tannin in the wood, which naturally protects it from insects and the elements. Western Red Cedar is available in dimensions from 1×2 which could be used as trim or shingle ledge, to larger sizes, like 4×12, which are frequently used for rafter tails or pergola beams, up to 16″X16″ and 32′ in length for timber framing or massive entryways. Other common uses for Western Red Cedar include exterior trim boards, pergolas and gazebos, planter boxes, interior accent walls, bird or bat houses, or any other application that would require the beauty of a natural wood and/or the exterior durability of this beautiful wood. 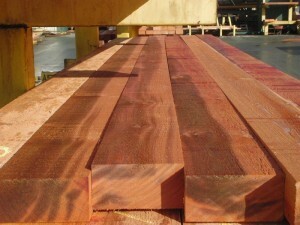 Please call Eastside Lumber & Decking with any questions you may have about Western Red Cedar.